We made it through July 2017 without a Google News redesign, but that doesn’t mean there haven’t been changes in the top publishers by search visibility in the U.S. Using our News Dashboard SEO tool, we looked at the visibility across a number of Google News-related ranking types on desktop and mobile. We then compared July data with the news websites that topped search visibility in June 2017 and the top publishers in overall Google News search visibility for January-May 2017. The News Dashboard also helps news SEOs optimize their articles for Google News. 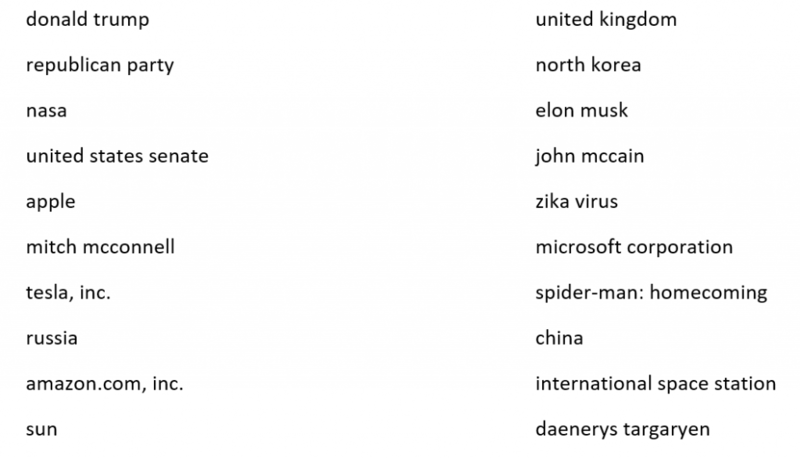 And if you would like to look at more historical data, take a look back at the top publishers in Google News U.S. for 2016. We started with a dive into the mobile side, with Mobile Visibility Overall. This KPI Dashboard report measures visibility in News Box Headline, News Box Text, News Box Carousel, Publisher Carousel and Newsticker. News Dashboard report showing the July 2017 Mobile Visibility Overall top performers in the United States. When we compare July to June’s visibility, CNN, the Washington Post and Fox News retained their spots. However, the Guardian and Yahoo have entered the Top 5 to replace USA TODAY and the New York Times. It’s interesting that Yahoo is back in the Top 5 this month, as it went from a frequent winner to dropping off the map earlier in 2017. Then we narrowed the mobile analysis down to just AMP Carousels – a subset of mobile News Carousels (which are themselves a subset of the Mobile Visibility Overall report above) that only includes Accelerated Mobile Pages, which Google has said it favors. This News Dashboard reports shows the top performers by search visibility in Google Mobile AMP Carousels for July 2017 in the U.S.
USA Today and Washington Post have switched places from the June visibility index, with Time moving higher in the pack, as well as CNN and Fox News both dropping down. However, all 5 have held their ground from the previous month. By drilling down on the July data point in the News Dashboard, we are also able to see which specific keywords USA TODAY had the most Mobile AMP Carousel visibility for in the month: tampa bay buccaneers; solar eclipse of august 21, 2017; mike evans; chelsea clinton; and nba. This News Dashboard drilldown report shows the keywords with the highest search visibility in Mobile AMP Carousels for the selected time period. Moving from mobile to desktop, we are much more likely to see more of the traditional media players appearing in the Top 5. The top performers by search visibility in Google News for July 2017 in the U.S. are shown in this News Dashboard report. The only change since June’s index is that Reuters has overtaken ESPN for the fourth spot. Once again, the Washington Post is nearly double the visibility of the next highest competitor. Last but not least are the desktop News Boxes, where competition has somewhat tightened up, but stills leaves CNN some breathing room ahead of Publisher No. 2. 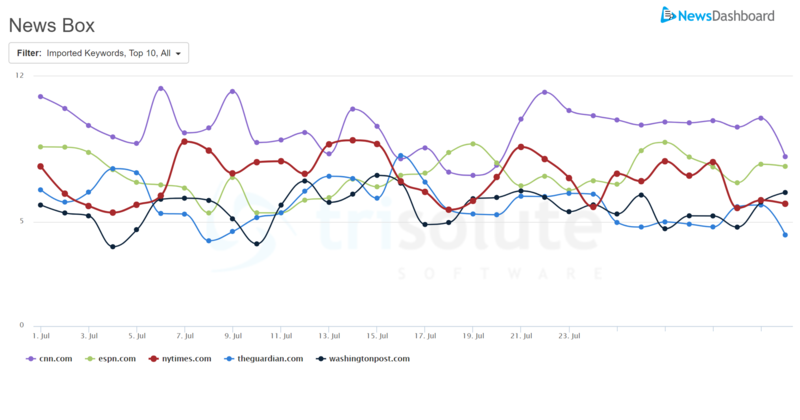 This News Dashboard report shows the top news publishers by search visibility in Google’s Desktop Google News Boxes for the month of July in the U.S. While CNN has slipped a little in search visibility percentage, it retains first place from the month previous; and the rest of the Top 5 remain the same as well. Below are the Google News Topics that have been picked up most often by our hourly measurement from Google News throughout July. For yet another month, Donald Trump is the top Google News topic in the U.S. The top Google News topics for July 2017 in the U.S. run the gamut from politics, U.S. and world to sports and entertainment. Increased tensions with North Korea and Russia show up in this list, as well as the usual suspects in politics, commerce and entertainment. It’s interesting that instead of “Game of Thrones,” main character and Mother of Dragons Daenerys Targaryen is a leading topic. If you’d like to analyze your current search visibility in Google News-related ranking types – reach out and sign up for a demo to learn more about the News Dashboard tool from Trisolute Software. And don’t forget that we’ll be at the Online News Association conference Oct. 5-7 in Washington, D.C. Stop by our ONA booth or make an appointment for a personal demo and the chance to win a DJI Mavic Pro drone.